Want to share your story and promote your brand or event to a national and international food and drink savvy audience? Food and beverage industry insiders Melanie Young and David Ransom are The Insatiably Curious Culinary Couple who bring a delicious new approach to exploring the pleasures of the palate. 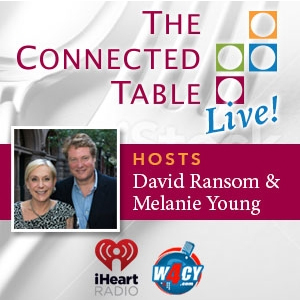 Listen to The Connected Table LIVE! Wednesdays, 2 p.m.ET./11a.m. PT. on W4CY Radio and on demand at www.iHeartRadio.com. Hear from chefs, restaurateurs, vintners, farmers, sommeliers, mixologists, authors, educators and others who shape the food and beverage industry. Support the industry and reach your target audience by advertising with us through our iHeart podcast series, The Connected Table SIPS! or through sponsorship of our live radio show, The Connected Table LIVE! Check out our shows here. Click the links to listen. The Connected Table LIVE! A 50 minute show Wednesdays 2pmEST. We profile movers and shakers who shape the industry from around the world. These are 20 minute live conversations. The show is permanently podcast to iHeart.com and free iHeart App. Dedicated shows (sponsored) can be considered. The Connected Table SIPS! Five minute recorded interviews with individuals focusing on a specific topic. These are sponsored and posted permanently to iHeart.com and free iHeart App. Each podcast is supported with a blog post and social media push. Sponsors may use for their marketing. Podcasts can be recorded on any day as well as on location.